Who should be Batter Number 2 for the Rays? When B.J. Upton left the Rays, not only did the Rays lose an amazing center-fielder and a playoff hitter, they lost a speedster. Upton was one of the fastest runners on the team; he and Desmond Jennings (or Carl Crawford) were known for getting on base, stealing bases, and scoring when the power hitters were up at-bat. Now that Upton is gone, Jennings remains at the top of the batting order, but the Rays haven’t decided who will be batter number two. 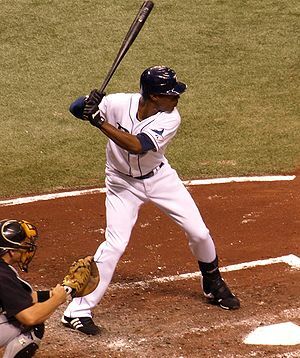 According to Wikipedia, the leadoff hitter is the fastest baserunner on the team and its his job to get on base and to score when the powerful hitters come up to bat – Jennings is the fastest player on the team and one of the most consistent batters on the team so it makes sense that he is the leadoff hitter. The second batter should be a “contact hitter with the ability to bunt a baserunner over or get a hit.” These baserunners should be quick to avoid batting into double plays and managers prefer left-handed batters because of the “gap in the infield cause by the first baseman holding the leadoff batter”. Out of the nine games played so far this year, Sam Fuld (4), Matt Joyce (3), and Sean Rodriquez (2) have been in the two-hole. Sam Fuld: Fuld is known for his speed and his batting average (BA) is .111 – the lowest on the team – with a on-base-percentage (OBP) of .241. His average BA is .241 and OBP is .322. Matt Joyce: Joyce is a lefty and is batting .174 with a OBP of .240. His average BA is .253 and OBP is .342. Sean Rodriquez: Rodriquez is able to run and is batting .143. with a OBP of .250. His average BA is .225 and OMP is .301. So far this season, none of the three have been impressive; but most of the Rays have not been hitting or getting on base. Fuld and Rodriquez are both fast baserunners and capable of bunting, while Joyce is more likely to get a hit and is a left-handed batter. Since Fuld and Rodriquez are utility players and Joyce only plays when the pitcher is a right-handed pitcher, this could mean the Rays may not have a permanent two-hole batter this season. It was the bottom of the ninth, two outs, a runner on first, and a 3-2 count – the Tampa Bay Rays had a nine inning rally going on. Ben Zobrist was batting and Evan Longoria was up next; the two best Rays hitters were up and could make a difference in the game. Texas Ranger closer Joe Nathan threw what appeared to be a ball; catcher A.J. Pierzynski’s glove touched the ground when he caught the ball. As Zobrist began his trot toward first base, home plate umpire Marty Foster shouted “strike!” The game was over – Rays lose 5-4. It was obvious to me and viewers everywhere that it was a ball – it was low and nearly bounced into Pierzynski’s Sports analysts, sports journalists, baseball fans, Rangers fans, and even football players took to Twitter to comment on how that was obviously a ball. Rays fans took to Twitter to express their anger about the call; how once again, the Rays lost because of bad umpiring. Now, there are those who will say “the game shouldn’t have been that close to begin with” or “mistakes happen, you try being an umpire” and I would go to bed angry and wake up in a better mood, except I’m tired of hearing those excuses. Why do umpires continue to determine the outcome of a Rays game? This is hardly the first time an umpire made a bad call against the Rays, it is becoming way too common for Rays fans to witness umpires controlling the game. Former Rays pitcher Matt Garza was switched in the pitching rotation because one home plate umpire believed Garza’s strikes were actually balls. Another umpire had trouble with B.J. Upton’s batting – the two would argue every year they met. And if the Rays are playing the Boston Red Sox or New York Yankees, Rays fans expect to different strike zones – one zone favored the big market team, the other ruined the Rays’ chances to win. As a low-market team with a small fan-base Major League Baseball (MLB) probably prefers a team that will bring in television ratings in October. That can't happen in a major league game. There has been seven baseball games this season and already two of the games involved umpires making bad calls against the Rays when they had momentum on their side. On April 4th, the Rays had another ninth-inning rally going on when Evan Longoria was called out for passing up Ben Zobrist while they were running bases. The cameras show that all the umpires were looking toward outfield to see if the ball was a homerun, none of them were watching Longoria and Zobrist running. When coach Joe Maddon asked them to huddle together to make sure one of them saw Longoria pass Zobrist, they refused. Now, umpires will make mistakes because they are human, so why does MLB continue to believe technology will hurt the game? Maddon could have “challenged” a call and had it reviewed – it would take a minute and all fans would be satisfied with the call. Other sports like football, basketball, and hockey use video-replay and the games have not gone on for half-a-day. As long as MLB continues to favor umpires, the umpires will continue to be the bad guys. MLB made a rule that coaches and players cannot argue balls and strikes, meaning umpires can get away with an unique zone. If a player complains about an umpire, he is fined but some umpires were allowed to complain about certain teams making the games last more than 3 hours. Now there is a possibility that certain umpires may try to hurry games along by using the strike zone to their advantage. But as baseball fans know, baseball is played in all 9 innings – the Cincinnati Reds scored 9 runs in the 9th to beat the St. Louis Cardinals just the other day. And if an umpire is ever in trouble for making a bad call, it is not made public like coaches and players. If MLB continues to let umpires take the blame, fans will continue to believe that baseball favors certain teams over others. Its time for MLB to stop letting umpires get away with bad calls but removing some of the human element and replacing it with technology – it is 2013, not 1913. Now we know what happened to Goodell's replacement refs. Roberto Hernandez’s first start with the Tampa Bay Rays was overshadowed by Chris Davis’ unbelievable start this season. After driving in seven runs in the first two games of the season, one would expect the Rays to walk him each time at the plate. Today, he showed that he can hit, ball or strike. The first inning went by smoothly for Roberto Hernandez – he struck out Nate McClouth and got the next two batters to ground out. For the Rays, Desmond Jennings led off with a walk, but he only manages to get to second base during the inning after being tagged out on his way to third base. In the 2nd inning, Adam Jones singles and then Chris Davis steps up to the plate… and hits a homerun. This makes homerun number three for Davis. In the bottom of the 2nd, Yunel Escobar walks but is caught stealing, ending any threat. In the 4th, Davis is hit by a pitch – probably intentional since Davis has been killing the Rays all series. Rays finally get a hit in the 5th inning thanks to Evan Longoria. Yunel Escobar singles, James Loney singles, and Jose Molina singles, making it 2-2. The Orioles answer back in the 6th when Nick Markakis walks, Jones singles, and Davis doubles, making it 4-2. Rays should have just hit walked Davis again. In the 8th inning, Cesar Ramos is able to get Davis to ground out, but allows J.J. Hardy to homer with Matt Wieters on base. Orioles now lead the Rays 6-2. In the bottom of the 9th, Sean Rodriguez is hit by a pitch (probably retaliation for Davis being hit, through Rodriguez does get hit the most on the Rays team). Zobrist singles and then Longoria singles – the ball is almost a homerun and is almost caught by Jones. After Rodriquez scores, Longoria is thrown out of the game for passing Zobrist while they were running the bases. Coach Joe Maddon wants the umpires to huddle together to confirm the call, but they refuse. Replays show that the umpires got the call wrong, Longoria never passed Zobrist. The replay also showed that the umpire never witnessed it, meaning that once again, umpires interfere in the game. Though the Rays were down 3 runs, the umpires killed the momentum of the game. Longoria and Zobrist both admit they should of ran the bases better, but baseball’s replay refusal continues to anger fans. Rays lose the game 6-3. It is only game 3 of the season – pitching isn’t perfect and neither is batting, but they aren’t bad either. Pitching will improve and hopefully so will the offense. So far, the thing that stands out as being “perfect” is the defense. 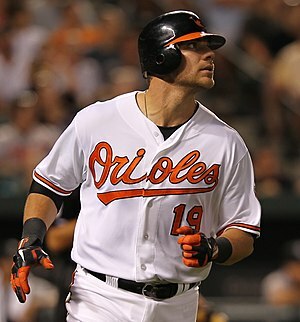 Also, Chris Davis is crazy good and it’s a shame the Rays met him. As Evan Longoria said, “Without Chris Davis, we’re at 3-0 without him in their lineup.” The Orioles scored 20 runs this series and he is responsible for driving in 11 of them. The last baseball player with at least 11 RBI in the first 3 games was Dolph Camilli of Philadelphia in 1935 with 12 RBI. Besides Davis, Orioles’ other threat was the starting pitcher. Miguel Gonzalez in his past four games against the Rays has only allowed 2 or fewer runs. Today, he only allowed two. When he entered the 5th inning today, he had tossed 17 1/3 scoreless innings at the Tropicana Field. Davis will cool down but the Rays need to figure out Gonzalez. Cleveland Scott Kazmir has a right rib cage strain, will be placed on DL. Will miss 2-3 games. The only teams not to win a game so far this year are the Miami Marlins. Fuld took the microphone and told us about his experience with diabetes. When he was ten, he was always thirsty and using the restroom, but when he lost ten pounds, his parents knew something was wrong. After taking him to a doctor, the family was told that Fuld’s sugar blood levels were at 500 milligrams per deciliter, way above average. When his parents found out he had type 1 diabetes, they were more worried about him than than he was while his younger sister was wondering why Fuld was receiving more attention than she was. But Fuld’s family always supported him his whole life; whether it was teaching him how to use insulin injections and keep track of his food or cheering him on at little league baseball games or professional baseball. When Fuld went to college, he realized (like all college students) that mom and dad are not there to make sure you are taking care of yourself. But baseball made him stay disciplined. At a time when some athletes become more concern about girls and parties, Fuld stayed focus on baseball which paid off when he was drafted by Chicago Clubs in 2004. Fuld is now one of the outfielders with the Rays and is known for making tough catches in the outfield, as reason why is nickname is Super Sam. Besides playing baseball, Fuld talks to children with type 1 diabetes to inspire them that they too can lead normal lives. For Sam, he is just paying-it-forward. When he was 12, he met major league pitcher Bill Gullickson. Gullickson also had type 1 diabetes, but still played a professional sport. Gullickson inspired Fuld and Fuld hopes that he will be able to inspire children by hosting “USF Diabetes Sports Camp” in February. At the camp, coaches and athletes with type 1 diabetes teach children with type 1 diabetes how to play sports. Last February, Gullickson was one of these coaches. Fuld hopes that he too can be an idol to children just like Gullickson was to him. After Fuld was done talking, he allowed the students to ask a few questions. I raised my hand and asked him “ Did anyone ever say to you that you shouldn’t play sports?” He said he wanted to say that “Someone told me no and I showed him” but he actually had encouraging family, coaches, and doctors. But he has heard of coaches being hesitant to put kids in, but he is hoping that the stigma associated with type 1 diabetes will soon die. After the question session, Fuld was whisked away to get ready for batting practice. As he walked by, I told him “Have a great game” to which he replied “thanks!” Because of Fuld, there are now 50 nursing students that are better prepared to take care of a child with type 1 diabetes and his family. So, I thought the Rays lineup was interesting, surprised to see Sean Rodriguez batting second. The lefties were out of the game – disappointed at that because I believe lefties can hit no matter if the pitcher is a lefty or a righty. I’m also looking forward to the Rays’ offense since Jeremy Hellickson’s average run support was 3.86, the 3rd worst in the league in 2012. The Orioles quickly took a lead in the top of the 1st after Chris Davis hit a 3-HR – after Hellickson was able to get the first two batters out. Desmond Jennings led off with a single, but Sean Rodriguez hit into a double play. In the 2nd, Evan Longoria singled and then Shelley Duncan hit into a double play. In the 3rd, Jose Lobaton singled and then Jennings hit into a double play – yes, a lot of double plays today. Meanwhile, Hellickson had been pitching well. Up to this point, all 11 Orioles runs this series came with 2 outs. The Orioles extended their lead in the 6th when Davis singled, driving in Manny Machado. Chris Davis drove in 4 RBIs at this moment. Rays answered back when Jennings doubled and Ben Zobrist drove him in. These two did the most damage in Game 1 and as usual, are the most dependable players on the game. After a pitching change by the Orioles, Longoria singled and then Shelley Duncan hit a homerun, tying the game. Ducan was supposed to be in the minors but was called up when Luke Scott started the season on the DL. Sadly, the game would not remain tied for long because Hellickson walked Nolan Reimold, Brian Roberts singled, and then Nate McClouth singled to drive in the run. Jose Lobaton almost tagged him out. Kyle Farnsworth replaced Hellickson and got Machago to ground into a double play, ending the threat. Orioles now lead 5-4. In the 7th, Matt Joyce singled on a bunt (beautiful bunt) and then Kelly Johnson singled; with Jennings battering, a wild pitch by Pedro Strop allowed Joyce to score. James Loney replaces Rodriguez and hits a double, making it 6-6, and then Zobrist singled, driving in Loney to make it 7-5. Now, its up to the bullpen to win the game. In the 8th, Joel Peralta gets two quick outs before allowing a double to Davis (I hate this guy) and then Matt Wieters singles, making it 7-6. Peralta strikes out J. Hardy. After 3 quick outs for the Rays in the 8th, its Fernando Rodney’s job to end the game. Rodney walks Nolan Reimold – though it should have been strike 3. Brian Roberts doubles, tying the game. Rodney’s first blown save of the year in 2012 was May 26 against Boston Red Sox, he blew only 2 saves last year, and it’s the 1st run he allowed since August 18, a string of 19 scoreless innings. Rodney gets the next two outs, giving the Rays batters one more time to win the game before going into extra innings. Matt Joyce steps up to the bat and swings, hitting a HIGH homerun. This was his first walk-off career. Rays win 8-7. What a great game between the Orioles and Rays. Though pitching wasn’t the best, it wasn’t too bad. Great to see Kyle Farnsworth end a threatening inning and there was no way Rodney could be better than last year, so at least he got his blown save out of the way now and not later on. I really wish coach Joe Maddon would let the lefties play, since Loney and Joyce helped win the game when they were allowed to play. Sorry, I just think lefties can play no matter who the pitcher is. Random fact: Rays only won 2 games in 2012 when they allowed 7+ runs. Texas Rangers Yu Darvish was one out away from completing a perfect game against the Houston Astros. New York Yankees starting pitcher Hiroki Kuroda exits in the 2nd inning after a ball hit his hand. Red Sox have been killing the bullpen throughout the game. Former Rays pitcher Scott Kazmir will not be making his pitching debut against the Rays on Saturday. Former Tampa Bay Rays pitcher, and current Cleveland pitcher, will not be pitching on Saturday. Kazmir strained his abdominal muscle during Monday’s workout. 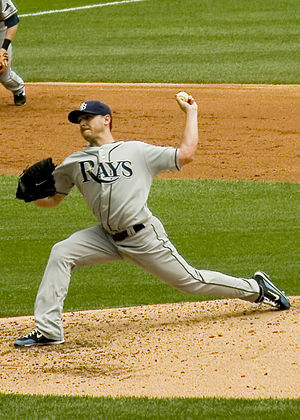 Kazmir grew up with the Rays and became one of the first great pitchers for the team that is now known for its pitching – Jeremy Hellickson won a Gold Glove and David Price was the Cy Young Award in 2012. Due to injuries, Kazmir was traded to the Los Angeles Angels and then spent the last years playing winter ball and in other little-known baseball leagues before making the Indian’s roster for the 2013 season. Kazmir was scheduled to make his pitching debut against his former team, the Rays, on April 6, but due to his injury, he will miss his first start. Its too bad because both Kazmir and the Indians need a fresh start after the past several disappointing seasons. Kazmir is currently heading back to Cleveland for a MRI.